Shop CATwatch - RSPB APPROVED CAT DETERRENT. 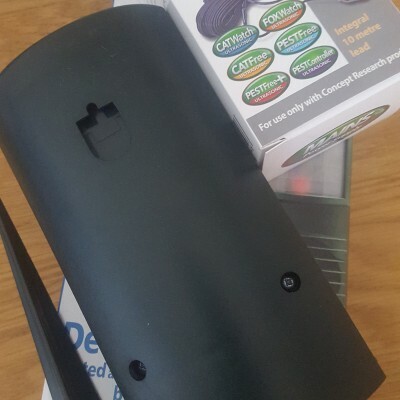 View basket “FOXwatch – The ultrasonic pest scarer that keeps foxes away from the garden” has been added to your basket. CATwatch actually trains even the most persistent feline visitor to stay out of your garden for good, that’s what makes CATwatch different. Tested and approved by the RSPB, following a two year field trial! Following the largest study of its kind ever undertaken in the UK, CATWatch is now the only cat deterrent, scientifically tested and approved by The Royal Society for the Protection of Birds (RSPB). CATWATCH IS POWERED BY 1 X 9v DURACELL ALKALINE BATTERY (NOT INCLUDED) OR OPTIONAL MAINS ADAPTOR. What are the first questions you may consider when buying an electronic cat deterrent? Does it work? Can you prove it? Well, the answer to these questions is YES! 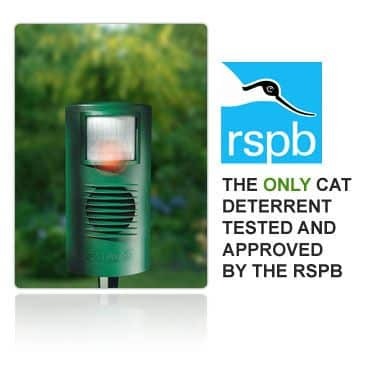 CATWatch, the UK’s leading cat deterrent manufactured in the UK, has successfully completed a two-year scientific trial conducted by the RSPB to determine its deterrent effect on cats in residential gardens. The results are published in the Applied Animal Behaviour Science Journal after peer review. The research concluded that CATWatch reduces cat intrusions into gardens. The longer the unit is in place, the more effective it is. So….now you are faced with a choice. Some units are cheaper, but may be less durable, less effective and cover a smaller area. CATWatch, on the other hand, is built to last, is a more cost-effective deterrent, proven to work AND tested & approved by the RSPB. It also comes with a two-year guarantee and has been on the market since 1993. CATWatch has been bought by tens of thousands of people throughout the world and yet fewer than 1% of all people who buy CATWatch return it for refund or exchange. 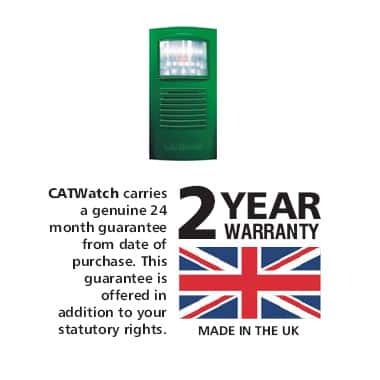 The fact is, CATWatch works and comes with a two-year guarantee so you can buy with complete confidence. Many people find cat-fouling a nuisance. This device is proven to reduce the presence of cats in gardens and the deterrent effect increases over time. 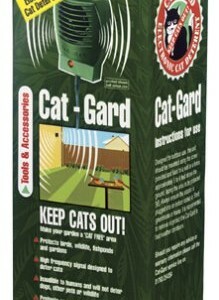 Put simply, CATWatch actually trains cats to stay away from your garden. 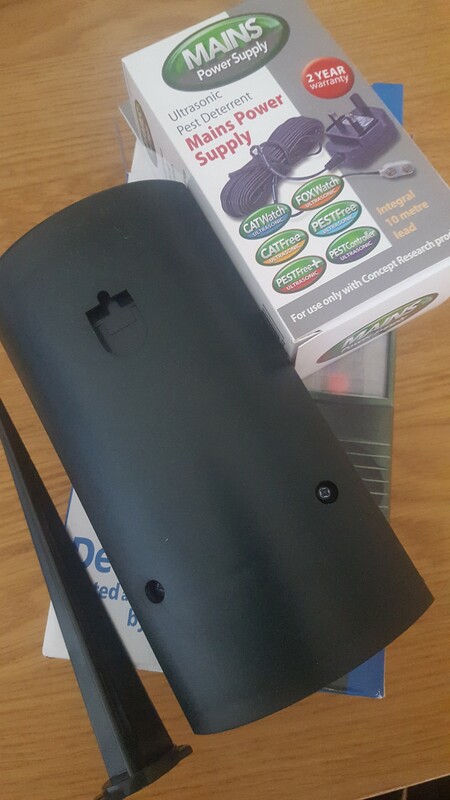 CATWatch does this by emitting a unique ultrasonic alarm, triggered by the cat’s movement and body heat as soon as it enters the protected area. The series of CATWatch alarm frequencies are set above the human hearing range so you can enjoy your garden in complete peace and tranquillity. 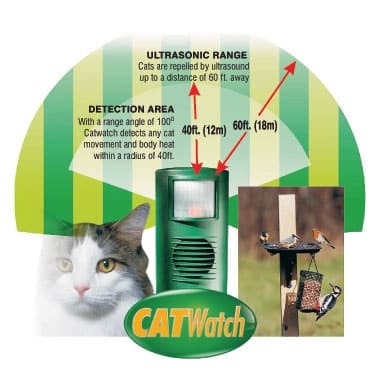 One CATWatch unit will protect an area of up to 1,350 sq. ft. – up to twice the area of other makes. Furthermore, many other deterrents simply emit a random or permanent ultrasound signal regardless of whether a cat is present or not, resulting in the deterrent effect reducing over time. That’s why many people who have tried other cat deterrents eventually choose CATWatch. CATWatch is designed to run trouble free all year round and in all weather conditions from -30 C to +60 C. The low voltage computer controlled micro circuitry is completely sealed inside the unit, the only deterrent with this feature, so that in the unlikely event of water entering inside, it will still continue to function and be absolutely safe to touch. No one really wants to cover their borders or garden ponds with unsightly netting to protect them from someone else’s cat! And probably every gardener has tried the alternative chemical products. Apart from being messy, they need constant re-application after every shower and their success rate at keeping cats at bay is inconsistent at best. 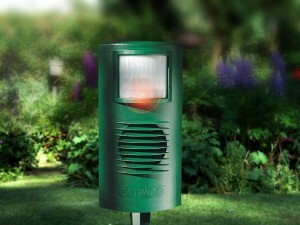 CATWatch can be moved and positioned at ground level in seconds or secured at the base of walls, fences and trees. Simply clip in a 9v Duracell Alkaline battery (not included) or use the optional mains adaptor kit, then switch on and relax. Note: We do not recommend using re-chargeable or cheap batteries as the functionality will be greatly impaired. CATWatch sells all over the world, because it works and keeps on working totally unobtrusively, making it far more cost effective and unbeatable value for money in the long run. How long does CATWatch take to work? Just like humans, cats have various behavioural traits. Some, upon encountering CATWatch will flee immediately. Other cats, of a more territorially dominant disposition, may actually settle down in front of CATWatch in an attempt to make it move on! However, ultimately the cats accept it is a battle they cannot win and move on to another area. Therefore please be patient if CATWatch doesn’t always appear to work right away. The scientific trials prove that CATWatch works. Our experience suggests, however, that it may take longer to do so in some cases. Cats Protection recommend CATWatch to their members as a safe and effective way of preventing cats straying out onto the road, or controlling their movement within the garden so the cat will avoid certain areas. When you switch CATWatch on, it automatically checks the power source (battery or mains adaptor) and when it is working properly you will hear a series of clear bleeps. CATWatch incorporates a self-testing microchip electronic diagnostic system which continuously checks the unit for correct operation. In the unlikely event of a problem developing, the red light behind the lens and/or the electronic click heard as the unit activates will stop working. As we cannot hear the alarm this ensures that you can easily check that is CATWatch working correctly. The mains adaptor is recommended if a lot of people or creatures pass by the unit because this may shorten battery life. (Average battery life – 2 -3 months – requires 1 x 9v Duracell alkaline battery). i. Maintains operation at peak efficiency as opposed to the declining power of batteries. iii. Long term economy – costs just a few pence per month to run. iv. Completely safe – only the thin 30ft 12-volt bell wire runs outdoors to the unit. What makes CATWatch so effective? Only the finest quality components are used to produce CATWatch. After many years research and development we established in particular, that maximum performance could only be achieved by using the highest specification equipment in four critical areas – namely the power source, LED detector, micro chips and speaker. It is this attention to detail that has made not only the original, but still the best electronic cat deterrent available in Britain today. Passive infra-red sensor detects body movement and heat – so no hiding place for cats.